"It sure don't seem like it was meant for burnin' material, seems more like it was meant for burnin' personnel." The Type-3 Antipersonnel/Antimaterial Incendiary Grenade (T-3 A/AIG), colloquially known as the Incendiary Grenade or Firebomb or Flame Grenade, is a grenade used by the Jiralhanae. The Type-3 Incendiary Grenade is a multi-purposed infantry explosives munition, and can be thrown 10 meters by the average soldier. The filling contains pyrophoric alkali metal Caesium chemical compound, a stable yet hazardous chemical compound that was developed by the Jiralhanae. Upon impact with a hard surface, the casing converts to liquid form, burning at around 2200 °C (3992 °F), and causing significant damage to vehicles and infantry alike, automatically killing all nearby infantry in a 4.7 meter (15.5 foot) radius. The stable caesium mixture filler also escapes from the burning casing, splashing over nearby objects and causing significant damage as it burns for 4.5 seconds. The Type-3 Incendiary Grenade was first developed by the Jiralhanae on their homeworld, Doisac. The Sacred Promissory took over the grenade's development and production and started manufacturing several months prior to the breaking of the Covenant Empire. The Incendiary Grenade is very effective against the Flood, even if the grenade only contacted the ground they are standing on. It can kill up to three Flood combat forms or Flood pure forms in a close group, even ones as large as Tank forms. They are also useful against large swarms of Pod infectors. When stuck to a Flood carrier form, the resulting fire will burn it completely, and it won't release any Pod infectors as a result. The Incendiary Grenade is the only grenade that can "stick" on to Jiralhanae Chieftains and War Chieftains, so use them if necessary. This feature makes the grenade arguably one of the most effective ways to deal with Chieftains; however they will have no effect when used against the Invincibility equipment used by Jiralhanae. The Incendiary Grenade has no detonation time, so it will ignite instantly when coming into contact with either enemies or structures. This feature is particularly useful when escaping from the Flood. "The filler seems to be a liquid or a gel or something; it dissipates pretty rapidly under water—I don't know how it would behave in hard vacuum." "It doesn't burn under water, unless it's already on something and burning. A "thermite", otherwise heat, grenade will burn under water and that crap has been around forever. Hey, is it just me or does Brute tech seem to be all over the map? Either there's no info sharing on Brutonia or something bad happened." "Baby Kongs use 'em exclusively as AP grenades. Kongs tend to capture or abandon material more often than they deny it." "None of the other alien foxtrots use 'em. Either the bravo kilos don't trust 'em with 'em or the rest of 'em ain't as keen on burnin' folk as kilos are." The Jiralhanae will avoid consuming their enemies whom had been exposed to the Caesium mixture due to its toxicity. Killing someone in multiplayer with this grenade will award the player with the Incineration Medal. Its function is very similar to a Molotov Cocktail. For this reason, players sometimes refer to the Incendiary Grenade with names such as, "Anti-Water Balloon", "Satan's Grenade", "Lava Can", and/or "The Cocktail". Even though Incendiary Grenade is the proper name, it is referred to as the "Firebomb Grenade" in the game. It only appears in four Halo 3 campaign levels, The Ark, The Covenant, Cortana, and Halo. It does not appear by default on any Multiplayer map, nor does it regenerate using the "Grenade regeneration" option. They are only available if they have been previously added in Forge. Firebombs generate a small explosion if shot while active and in any occasion in Halo 3 and Halo 3: ODST campaign, instead of a pool of fire. They must be ignited prior to impacting a surface to create the pool of fire. A cut-out of the grenade. 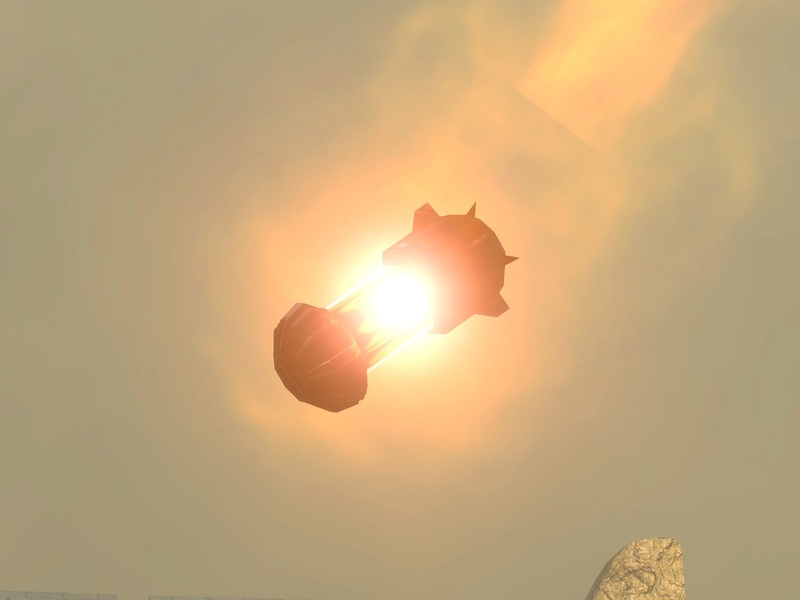 An in-game view of the Firebomb Grenade in Halo 3. 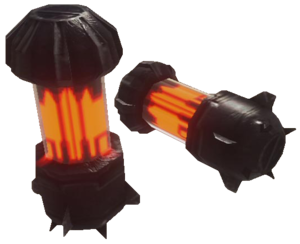 A pair of Incendiary grenades in Halo 3. An Incendiary Grenade, after being thrown, activating itself. An Incendiary Grenade in mid-flight.